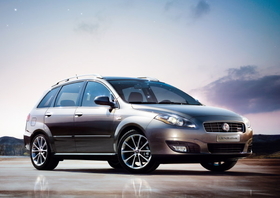 Fiat's Croma hatchback will be replaced by a Dodge-based mid-sized sedan. TURIN - The Chrysler badge will disappear from cars sold in Europe by 2011 leaving the U.S. carmaker with Jeep as its only nameplate in the region. Under Fiat S.p.A's restructuring plan for Chrysler Group, Chrysler and Dodge cars will be rebadged as Lancia or Fiat models to streamline capital expenditure and distribution costs. • Selling the Chrysler Voyager as a Lancia model to replace the Italian brand's Phedra minivan. • Rebadging the next-generation Chrysler 300C as a successor to Lancia's flagship Thesis sedan. • Selling Chrysler's next Sebring sedan and a new mid-sized crossover as Lancias. • The Dodge Journey will be sold as a Fiat-branded replacement for the Ulysse large minivan. "In North America, Lancia models will complement the Chrysler brand and in Europe the opposite will happen," said Olivier Francois, CEO of the Chrysler and Lancia brands. Michael Manley, CEO of the Jeep brand and head of Chrysler Group international sales said Jeep will become Chrysler Group's only global brand. Outside of North America, the Dodge and Ram brands will only have special or regional roles, Manley said. In the first 10 months of the year, half of Chrysler Group's sales outside North America were Jeep models.